This dazzling super luxury beachfront villa offers the same high quality contemporary interiors as the nearby Mirador but includes a fifth bedroom. Nirvana’s top floor has been transformed into a unique sunset bar with plenty of seating, offering elevated sea and beach views. The ground floor living areas are spacious with a large family room, comfortable sofas and a 65 inch flat screen TV. The best in chef prepared cuisine can be enjoyed in a formal setting within the luxurious and air conditioned interiors or around the perfectly square alfresco dining table which can seat up to 12 guests. Foodies can marvel at the delicacies being created in the well equipped kitchen with bar stools for easy breakfasts. Both dining and family rooms open onto the wide covered terrace and then onto the outstanding outdoor areas with informal dining, sun-loungers, enticing swimming pool and direct access to the beach. Perhaps the best spot for relaxing in the company of friends and family. Retractable awnings or large sun-umbrellas offer plenty of shade. The ground floor also offers a beautiful guest bedroom whilst the master bedroom and 3 other bedrooms are located on the upper floor. This extremely popular beach front villa is ideal for families and features an expansive covered terrace for outdoor living and taking in the exceptional sea and sunset views, as well as a pool table downstairs and a small private pool. The local Jordans supermarket is walking distance away. 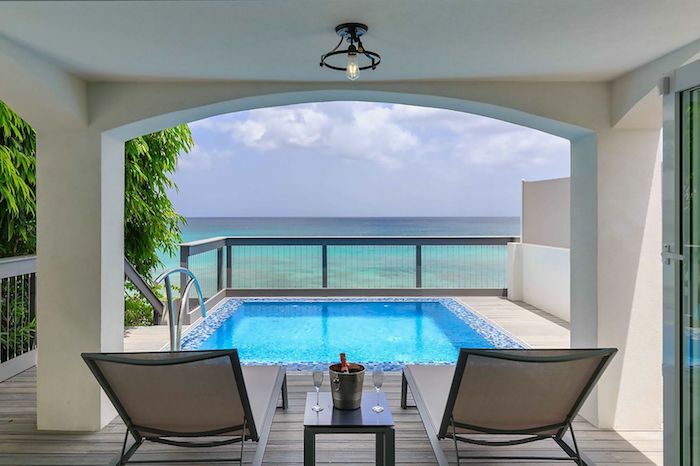 Set on the beautiful west coast of Barbados, in Prospect, St James, this three storey 4 bedroom ocean front villa is a modern styled, stand alone holiday home with state of the art features and uninterrupted breathtaking views of the tranquil, turquoise-blue waters of the Caribbean Sea.